Most laboratory equipment requires regularly performed maintenance to ensure that research results are valid and equipment is working without delays. It is important to be aware of manufacturer recommendations for the maintenance period. During maintenance, equipment is calibrated, possible spare part change is performed, and overall functions are checked. Nordic Service Group only uses calibrated test equipment and all service is traceable. Following the manufacturer recommendations for preventive maintenance, equipment is more reliable to use. In case of equipment malfunction, we are ready to help you onsite as fast as possible. Smaller equipment can also to be sent to our local workshop throughout the Nordic region. We have local hotline support to help you with the best possible solution. We use only original spare parts during equipment maintenance and repair. We sell and deliver spare parts for laboratory equipment. 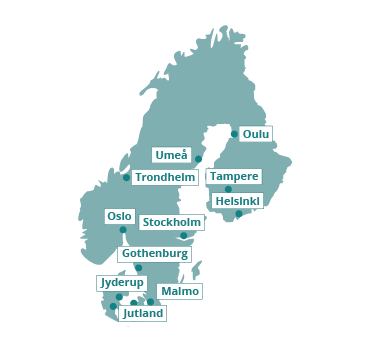 If you are seeking only original spare parts, please contact your local Nordic Service Group office and we will help you identify what you need. Are you a distributor or manufacturer? We are always interested in new opportunities to share our expertise. Please contact our local department for more information. Centrifuges are regulated to meet safety requirements and recommendations for mechanical as well as electrical safety. Maintenance must be performed annually to ensure functionality and safety for the locking mechanism, imbalance switch, rotors, corrosion and wear. Additionally, electrical safety tests, including ground leakage and connectivity, are also needed. Incubators need a yearly preventive maintenance to ensure that temperature, CO2 and functions are within specifications. This will decrease the likelihood of breakdowns and ensure proper functioning. Shakers need to be serviced according to manufacturer recommendations. Regularly performed maintenance ensures that shakers are safe to use and work according to manufacturer standards. Heating cabinets need to be serviced according to manufacturer recommendations. It is important to ensure that conditions are optimal for the right purpose. Regularly performed maintenance for microscopes is necessary to prevent delays during research. Nordic Service Group is an authorized service organization for several microscope manufacturers. Pipettes will undergo calibration and testing to ensure that they meet the specifications in the standards: ISO 8655, DIN 12650 or SOP (Standard Operating Procedure). This should be performed annually to ensure functioning of pipette volumes in terms of adjustment and possible replacement of old parts. Nordic Service Group offers both traceable calibrations and accredited calibrations. Visual inspection internal and external. Inspection of mechanics and wearing parts. Volume calibration with weight measurement equipment. PCR instruments are to be validated, calibrated and functions checked to ensure that the instruments meet manufacturer specifications. This is recommended to be performed annually to ensure operation and safety in regards to temperatures in the wells. The electrical system should be checked in regards to grounding, leakage current and connectivity. Temperature validation of the thermal blocks. Check of temperature in lids. Visual inspection of instruments and wells. Check of fan system/heat dissipation system. Hematology analyzers need to be serviced according to manufacturer recommendations. Only through regular maintenance, it is possible to receive reliable results. TOC analyzers need to be serviced according to manufacturer recommendations. Regularly performed maintenance ensures that TOC analyzers are safe to use and work according to manufacturer requirements. We are more than happy to tell more about our services. Please contact your local department for more information.